Oh boy. Poor old WUWT-ers are in for a boring time. Befuddled Jim Steele is back and has written an even more muddled article at WUWT. For those who weren't pronounced brain-dead after his last bowl of tripe, they will be after this one (archived here). If natural cycles are indeed the climate control knob, the next 2 decades should witness a cool phase of the AMO and the retreat of southerly marine organisms. And the current scientific consensus that the upper 300 meters of the oceans have been cooling since 2003 bodes well for natural cycles prediction. 700 metres, 300 metres - what's 400 metres difference! I don't know where he gets the upper 300 metres of oceans have been cooling from. Jim put a number beside it but it leads nowhere. Last time around he claimed it was the "upper 700 meters of Argo’s ocean data [that had] a cooling trend since 2003". This time he's dropped it back to 300 metres. He's got a Part 3 coming. I wonder will it be the "upper 100 meters cooling" next time? Anyway, here is a chart showing the temperature changes in the ocean to both 100 metres and 700 metres. Since neither depth has cooled since 2003, the upper 300 metres could hardly have got any cooler. It's easy to guess what Jim means by "believers" - and it's about the only accurate thing he's written in the entire article. Science deniers "believe" what they want to believe rather than explore facts and many of them "believe" we're heading for an ice age - any day now. And have "believed" that like, forever. A bit like there are "believers" in an imminent "day of judgement" or lizard men or flying pigs. For the rest - natural cycles are the climate control knobs? Meaningless. What natural cycles? What controls the natural cycles. Settled (sic) the debate? What debate? Why has nature been cycling in the same direction for the past hundred years or so? Hotter and hotter. That's not a cycle that's a speeding locomotive on a straight run! If you want unnatural cycles, Jim Steele cycles between pursuing his strange vendetta against Dr Parmesan and shouting to all who'll listen that "it's not happening". What an odd "essay". Why Anthony put it on his blog is anyone's guess. Perhaps he is very hard up for essays. Jim's post has been up for a while and so far there are only six comments. Partly that's because most of the WUWT readers (who are in the USA) are fast asleep. The rest of them probably went to sleep reading Jim's article. It’s all and none of these. Just because the redistribution of heat from ocean currents is consistent with polar temperature observations does not mean it is the sole or even dominant cause. But that narrow focus has biased Hansen and his disciples who have underestimated the power of ocean oscillations. Of course, Hansen was making his projections before the PDO was described by science (i.e., 1996). So he ascribed the natural PDO warming to CO2 alone. Take it from 1950 when CO2 became significant and we see 1.1C/century warming. That’s over one complete PDO cycle (so that balances). So we see CO2 forcing according to Arrhenius — without net positive feedback. And that’s assuming the sensors are accurate, and 4 out of 5 of them ain’t. ...The PDO represents the spatial pattern of the sea surface temperature anomalies in the North Pacific, not the sea surface temperature anomalies. 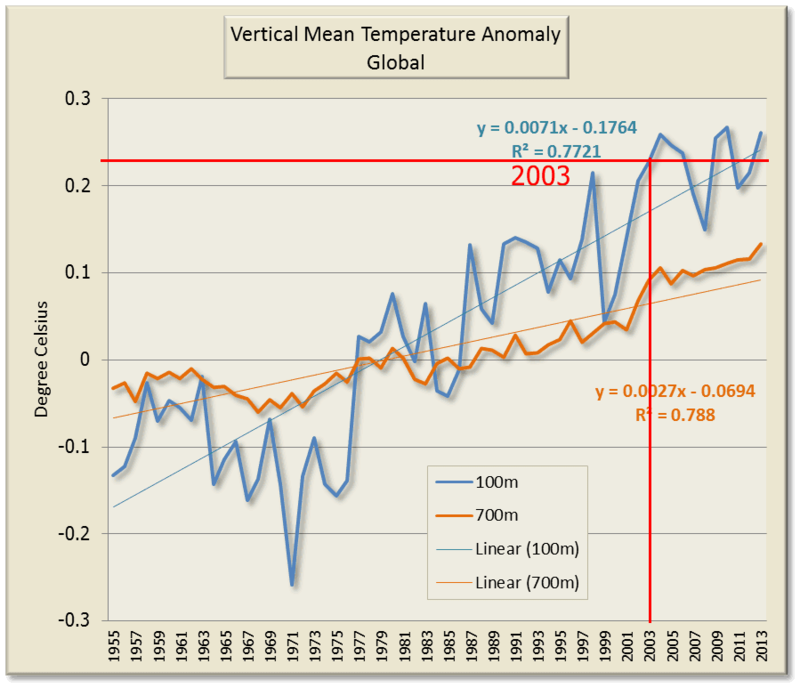 There is no mechanism through which the PDO can alter temperatures globally. ..
What a clear illustration of the extent to which science has been blinded by the UN and Governments funded CO2 mantra. I wonder if scientists who have entered the fields of ‘climate change’ in the last 10 – 20 years are actually still capable of critical appreciation of true science and the extent to which you must look to explore all possible causes and explanations. Given Jim's fixation, I'd say their paths have already crossed somewhere along the line. Perhaps only in Jim's mind - there's a hint of the stalker about his behaviour. Or perhaps they have encountered each other and mace became involved? I doubt we'll ever know for certain. All the graphs in the SI are are basically saying that concerning OHC: "the only way is up". But that's not a good thing in this case, obviously. And about 1/3 of the OHC has been going into the 700 - 2000m layer recently. Trenberth's 'missing' heat. This year feels like it will be pivotal. Between the building El Nino, Jo Nova's new 'climate model', the different government actions (EPA, Australia, Europe, ect), the arctic 'rebound' (a one year rebound? Really? ), and many others, there is a sense that many prodictions are going to be eather proved or discredited for good. Personally I predict that whoever gets there predictions wrong (on eather side) will be blaming 'natural cycles' or variability. It won't be pivotal. The denial squad has been through this over and over; they only slowly leak support it seems. I sense a sea-change myself. The denialist cult will survive, but it's into that long tail of decline that such movements usually experience, like the Hollow Earthers. In Denial Central (aka the US) it'll be interesting to see if the Republicans make AGW a feature of their campaigns this year. Their candidates have made the right noises in primary campaigns (of necessity) but the "I'm not a scientist but jobs/Iraq/Benghazi" response is becoming more common in the wider world. Then there's Paris 2015 and the US 2016 elections, quite apart from what goes on in the real world. I think by 2017 we'll see we're over the hump. Well, Nova and Evens model may not be pivotal, but it's sure turned up the heat. sou, please tell me you're doing a post on the cooling thread at WUWT. Willis tearing the david's a new one over it alone was worth the price of admission. "The denialist cult will survive"
I doubt that many of these people will ever be willing to recognise the extraordinary harm they have caused. When Jim wrote "And the current scientific consensus that the upper 300 meters of the oceans have been cooling since 2003 bodes well for natural cycles prediction." he references a study by I.G. Rigor. But in it is nothing about a 'scientific consensus that the upper 300 meters of ocean has ben cooling since 2003', nor does it have anything about 'natural cycles prediction'. The study is about how the NAO affects Arctic sea ice thickness, which in turn affects the heat flux from the ocean. Jim grossly misrepresents the study. But this is typical of what Jim does. He uses scientific papers to bolster his own ideology, to make it look somewhat 'scientific' , when infact what he has done his totally misrepresent the study. Off course climatic and physical processes are subject to natural cycles, but he creates a logical fallacy, in that because the sea ice for instance has a natural cycle, therefore it cannot have any anthropogenic influence. Hi whole essay is just one big 'it's all natural' logical fallacy.